– Billy Bush, co-anchor, Access Hollywood, Today Show contributor, host of the radio program, The Billy Bush Show and Curtis School parent. – Mark and Avis Ridley-Thomas, Los Angeles County Supervisor Mark Ridley-Thomas and his wife are the parents of twin boys who attended the Wilkerson Academy of Learning, the Pilgrim School, and Loyola High School, and they both recently graduated from the historical Morehouse College. – Amy Levy, President of Amy Levy Public Relations. Amy and her husband, Chad Savage, are parents at Temple Isaiah Preschool. 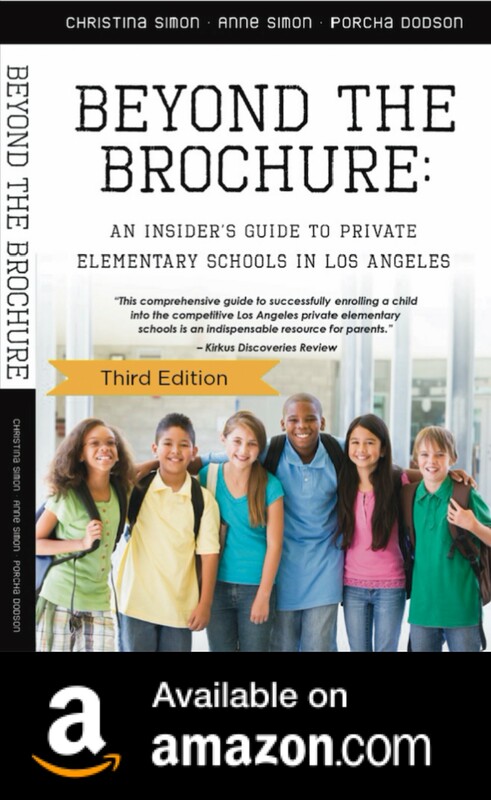 “This comprehensive guide to successfully enrolling a child into the competitive Los Angeles private elementary schools is an indispensable resource for parents. The book is authored by three women, each with a background that makes them credible authorities on the subject. Two have experience reviewing private-school applications as well as administering testing procedures and school tours, while the third is a parent who has successfully placed her two children in a L.A. private school. The book outlines the process of finding the right school and getting your child in. The authors explore various types of schools and detail their different philosophies and teaching strategies. They also tackle the parental and school interview, the tour experience, the application process and more—right up to the child’s first day of school. Simon, et al. provide reassuring advice on enduring this intimidating process (which is every bit as daunting as applying to college), and cite a startling statistic—a top-notch school in L.A. may receive more than 500 applications for 30 kindergarten spaces. When choosing a school, the authors suggest that parents consider the child’s personality and learning style, the educational philosophy of the school, the tuition costs and the proximity of the school to home.